3 Ankara Üniversitesi Tıp Fakültesi Tıbbi Biyoloji Anabilim Dalı, Ankara, Türkiye DOI : 10.5152/tftrd.2015.56255 Objectives: In this pilot study, we investigated whether the collagen type 1 alpha 1 (COL1A1) gene polymorphism is a predictor factor for bone mineral density and vertebral fractures in Turkish women with postmenopausal osteoporosis. 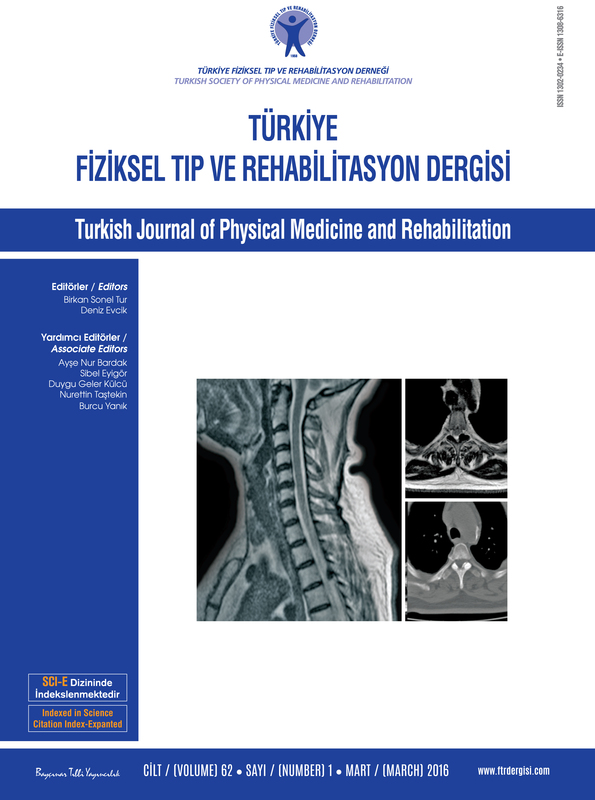 Patients and methods: October 2007 and February 2010, a total of 170 consecutive postmenopausal women (mean age 59 years; range, 40 to 75 years) referring to the Physical Therapy and Rehabilitation outpatient clinic, School of Medicine, Ankara University were included in the study. All patients had bone mineral density (BMD) measurement by Dual Energy X-Ray Absorptiometry (DEXA) at the lomber vertebra (L1-4) and femoral neck as well as vertebral fracture assessment. Of 170 women, 113 were diagnosed as postmenopausal osteoporosis based on the World Health Organization criteria. Remaining 57 women were assigned as the control group. All patients had genetic analysis of DNA samples from peripheral blood with respect to COL1A1 gene polymorphism by PCR method. Binary and linear regression analyses were done to reveal the role of evaluated factors (polymorphism, age, menopause duration, body mass index (BMI), smoking, low calcium intake, daily mild to moderate physical activity) in predicting fracture risk and BMD. Allele ratios found in the patient and control groups were searched for compatibility with the Hardy Weinberg equality. The allele groups (GG, GT, TT) were examined whether there is any difference with respect to clinical parameters. Results: The rate of allele was consistent with the Hardy-Weinberg equilibrium: GG 62.9% (n=107), GT 35.3% (n=60), and TT 1.8% (n=3). Of the patients, 49 (43%) had radiographically vertebral fractures.